"Giverny was not what I thought it would be. I had been for a long time interested in Impressionism's peculiar view of nature... This curious emphasis on leisure, plus the process of enshrinement that all famous art is subjected to, had conditioned me to see Giverny as a place more exactly situated in dreams than in reality. Nothing prepared me for the thousands of visitors who come to this village. I had no conception of how much work and planning it took to maintain a garden. The question that immediately became apparent to me was this: What drives people here? What is the meaning of this pilgrimage? I previously thought of gardens as decorative environments. What was unfolding before my eyes was a complicated process of interaction between two opposite forces, "nature" and "culture". New images were formulated for me. I had already seen in my previous work how certain "subjects" were politically loaded. It became apparent to me, as I watched the incessant prodding, cutting, twisting, the endless restructuring of what is, in the last resort, the vital force (Nature), that the most benign images can be fraught with ethical implications. 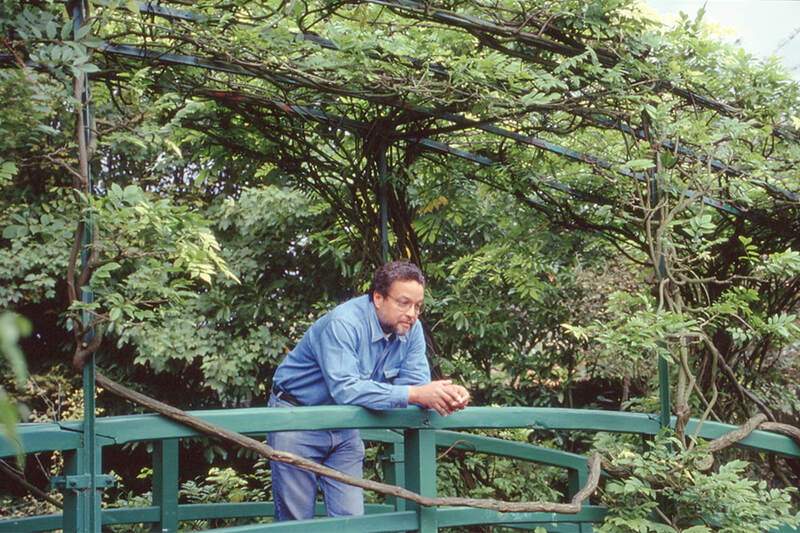 It is in that sense, not by any means negative, that Giverny was a learning experience for me. There is a saying: "As it is above, so it is below". The same issues of power and control that prevail in our view of nature also dominate our vision of society. Basking in the glory of France and the fame of Monet's gardens, the residency at Giverny is the perfect place to meditate on these values, their pervasiveness and their inadequacies." "The word symbol is derived from the Greek verb 'symballein' which means "to throw together". In the case of artists, like myself, rooted in alien or marginal cultures, symbolism becomes a kind of metaphysical bridge building. The very real dilemma of carrying one culture internally while having to operate in another makes symbol an instrument of choice."